The team for this comp was a little different than usual, as both Jon and Jay Jay weren’t able to come in and set. 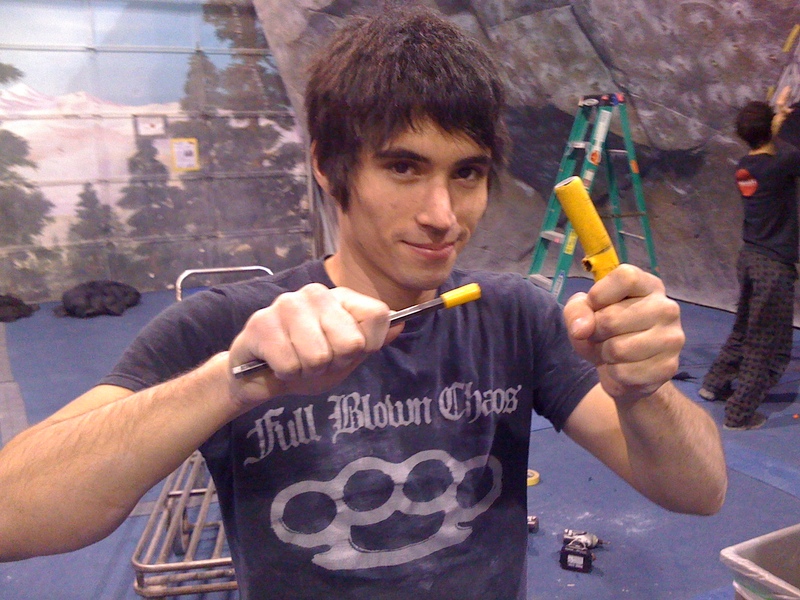 Luckily for us Nic Sherman was available for every stripping and setting session, and along with the usual team of Jonny, Carlo, Garrett, Danny, and I, we put all those sweet grips from the hold review to good use on the 42 recreational, intermediate, advanced, open, and finals problems. Nic setting the Beach all by his lonesome. 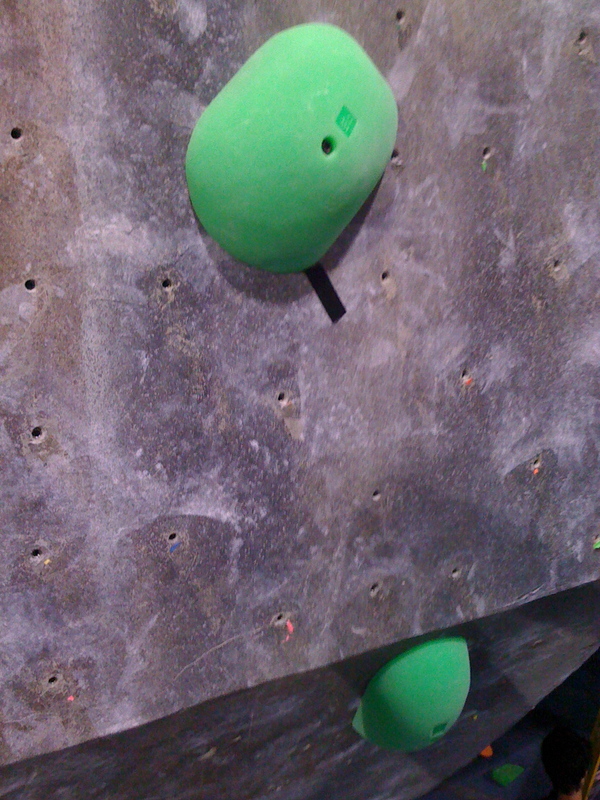 These are some of the Element holds, brand new for this comp since they arrived late for the hold review. Speaking of O9, how many setters does it take to get a little volume on the wall? 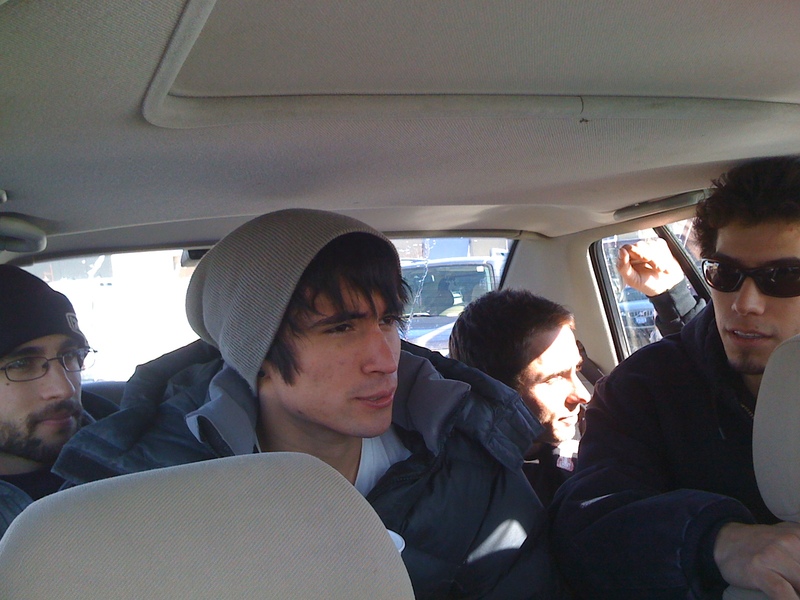 Because our team was smaller than usual, it took only one Volkswagen to get us to lunch. This is the Gladiator Finals, the conclusion of SBS Season VI, and therefore the most awesome of all the SBS VI events. There will be jousting. Avery beer in cans. Epic long finals problems. Wahoo’s tacos. Tons of sweet new tester grips. A huge raffle. E-Grips Bubble Wrap Sloper sneak peek. Did we mention the jousting? We BROKE WRENCHES setting for this thing, that’s how awesome it is. So don’t miss out!!! Breaking through 5/16" of solid metal? No problem for heavyweight setter Nic Sherman. SBS Season VI is drawing to a close, with Gladiator Finals only a week away! As usual, we will start stripping the Beach and the Dojo on Wednesday night at 9pm. Thursday both the Beach and the Dojo will be closed for setting. 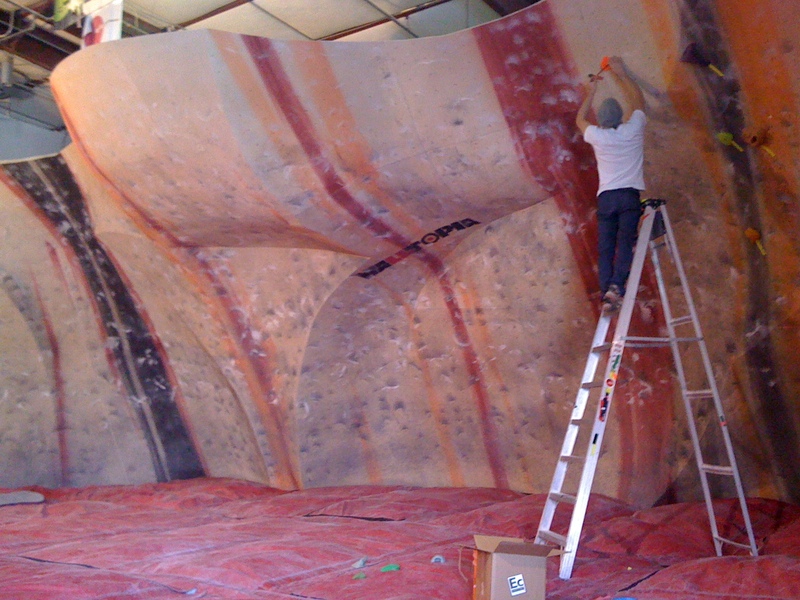 Thursday night at 9pm we will begin stripping the rest of the gym, and Friday we will be closed all day for setting. 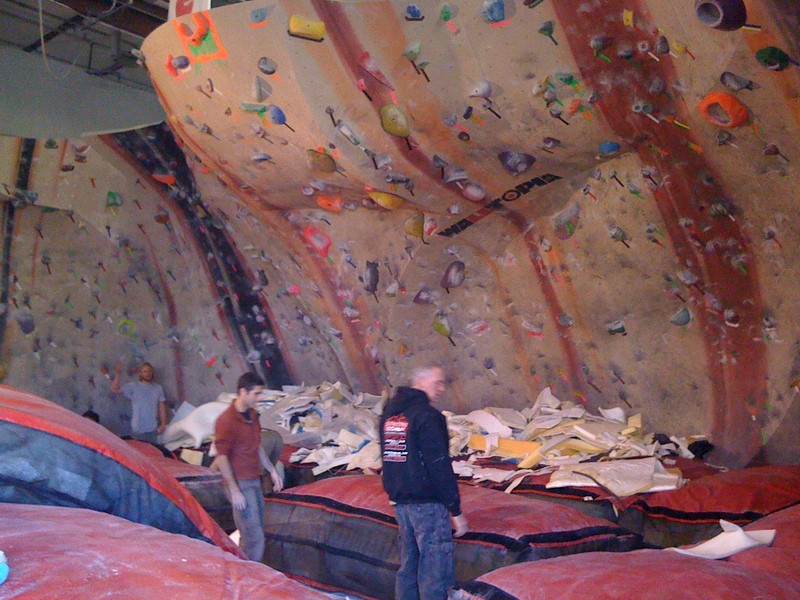 If you are a Spot member, you may climb at the BRC on Friday while the Spot is shut down for setting. If you are interested in helping us with some stripping/washing in preparation for the comp, please email spotsetters@gmail.com. We have a spot or two open on the volunteer schedule due to the busy schedules of our usual volunteers. Volunteers can earn free comp entries and/or memberships, depending on hours worked. Saturday, January 22nd, is Gladiator Finals Day! The comp will be in 2 sessions, youth from 1-4, adult from 5-8, GLADIATOR JOUSTING just after the adult session ends, then pro finals and raffle madness! And, of course, free Wahoo’s and Avery Beer!!! You can sign up in advance and skip the lines HERE. Finally, the Left River wall, which is home to the 2011 Spot/UC Mag Hold Review, will be stripped for the comp on Thursday night. Please make sure you’ve reviewed all the holds you’re interested in reviewing before then so we can use your opinions towards the ratings and article. Thanks! The Hold Review has begun + Gladiator Finals coming soon!!! The great Spot/UC hold review of 2010 has turned into the great Spot/UC hold review of 2011 (cause it took that long for all the holds to come in) but they did finally come in and so last week Carlo and the crew put company-specific problems of brand new grips up on the Left River wall for you to help us test out. The goal is to put together the most comprehensive and useful climbing hold review ever done by a climbing magazine, and we need your help. Here’s the deal: each company-specific (i.e. all the holds on the problem are from one company) problem in the review will be found on the Left River wall and clearly labeled with the hold company. Because we set multiple problems with each company’s holds, the problems are also numbered so it will be easy for you to tell us exactly which problem had that sweet fat pinch or tricky Font sloper that you liked so much. 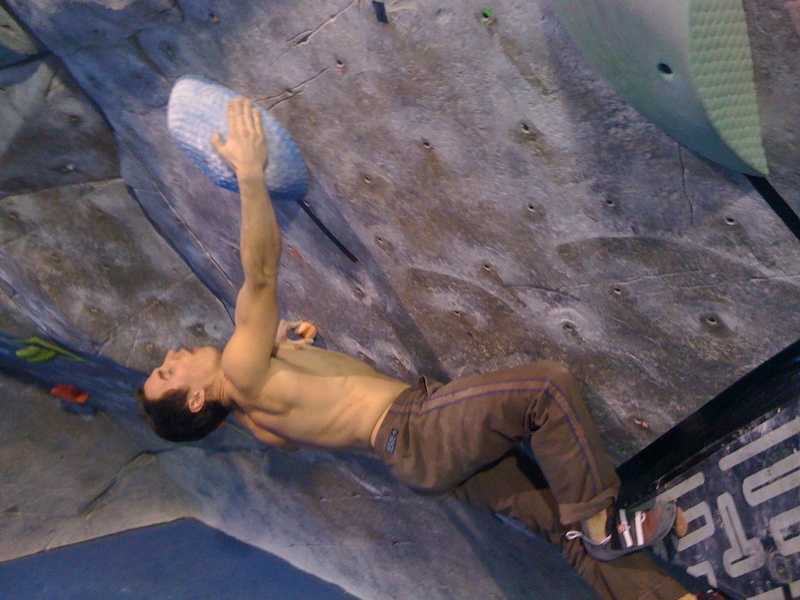 Climb some problems, give us your opinion, and if you review at least 5 company’s holds you might even win a prize! Pick up your review forms at the Front Desk or on the left side of the Left River wall (by the garage door). Questions can be posted to this blog, or emailed to Jackie at spotsetters@gmail.com. Thanks!!! It was my intention, and still is, to post about each company that is taking part in the hold review individually upon receipt of their holds. Unfortunately, before we had received all the holds my grandfather’s lymphoma progressed I had to leave Boulder to get home to see him before he passed. This is also why the blog updates have been more or less non-existent of late, so, sorry, but I should be back in action with regular updates again soon. Gladiator Finals are coming up! 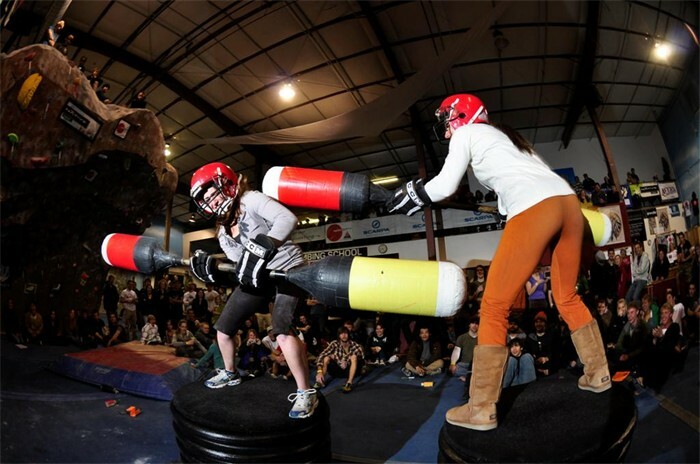 Spot in time for the Gladiator Finals, which will be held on Saturday, January 22nd, and will include a sweet jousting rig in addition to the normal Spot comp amenities of great new problems, exciting finals, a huge raffle, and free Wahoo’s tacos and Avery beer. A strong contingent of men showed up for the open category, and after crushing many (most?) of the open problems we had our 6 finalists, all who were, fortunately, in attendance (see Women’s Open Finals for a slightly different scenario). So who were these strong men? Qualifying in order from 1st – 6th were: Jon Cardwell and Matty Hong (tied for first), Colin Bauer, Ian Dory, Gabor Szekely, and Tyler Haack. The men’s final was set by Carlo Traversi, who you probably know got back from Switzerland. Carlo quickly came up with a few neat balance moves followed by a powerful drop-down and then a sequence of burly pinch throws to a campus from the double bubble to the finish pinch. 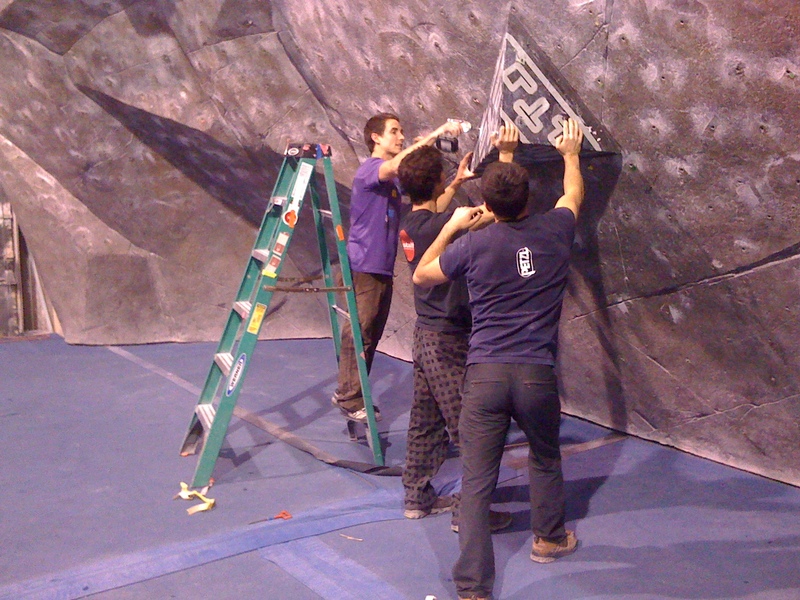 Tyler and Gabor both dropped off on the pinches before Ian barely climbed through them for the problem’s first flash. Colin Bauer came out and also succumbed to the pinch sequence, as did Matty on his first go, though he was able to send the problem 2nd try. 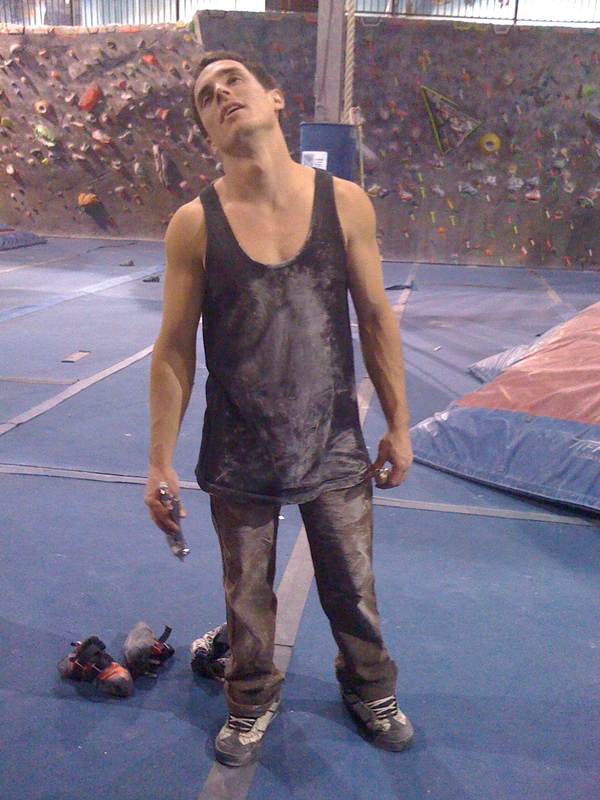 Last out was Jon, who fought through the pinches to powerfully flash the boulder and win the comp. The Women’s Open Finalists were surprisingly difficult to figure out because when we compiled the youth and adult results it turned out that 3 of the finalists, including 1st place, should have been youth competitors. Unfortunately, Megan Mascarenas (1st), Laurel Todd (4th? ), Isabelle Goodacre (5th?) and Tika Anderson (6th? 7th?) had all left the gym and therefore couldn’t compete in finals. Tika made it back just before Jesse, who qualified in 1st, was to take her turn, and unfortunately we couldn’t let her compete at that point although it would have been sweet to have Tika in her first Spot finals ever. Anyways, after a bit of running around we found the top 6 competitors who were still present and got them ready for their finals problem. This comp’s Women’s final was set by Jon Glassberg and Danny Ciavarro. Unlike the finals problems from the last 2 comps, this problem was relatively short (12 scored holds), and consistently powerful. Courtney Behnke was up first, and after a strong showing on the bottom moves she took a dramatic belly-flopping fall off the long, powerful move to the big green Climb-it rail in the middle of the problem. The crowd gasped, but Courtney jumped right up and got back on the problem for her next go. Chelsea Rude came out next and, after looking a bit questionable on the long move, turned on the power to catch the big green hold in style and hike the rest of the problem for the flash. 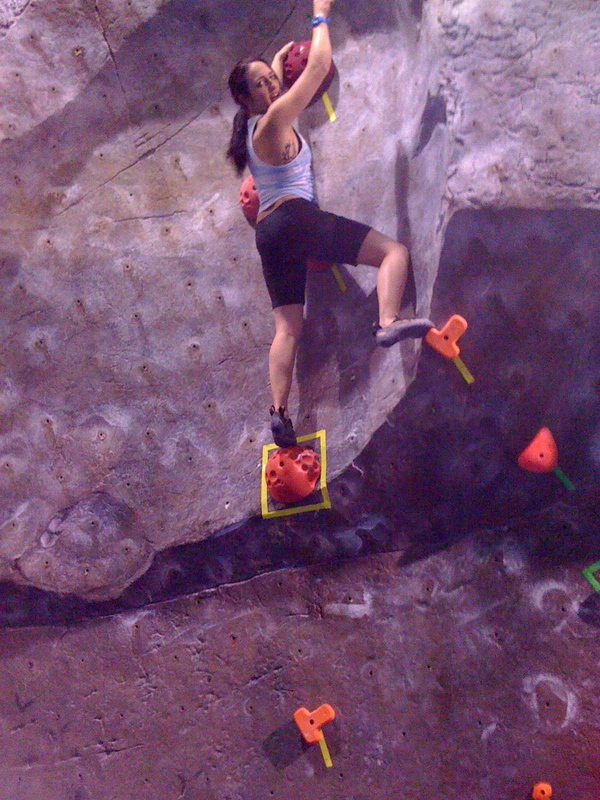 Kara Caputo was next, and looked like she was easily flashing the problem until she just missed holding the final hold. Tiffany Hensley came out for her go looking strong, but bobbled the long move to the big green hold and landed surprised on the mats. Knowing Chelsea had already flashed, Tiffany decided to go for entertainment value and put on her crazy green-swirly goggles before hiking her way to the hold she’d previously fallen from. Once she got there she made up for Adam Markert’s not competing and hung around mugging for the crowd before making her way to the final hold where she did a few victory pull-ups before dropping to the mat. After Tiffany came the twins, Tyler first and Jesse second. Tyler was cruising, introducing a powerful and styley bicycle for the long move, but she accidentally stepped on an off foothold immediately after and had to start over from the beginning. Her next go she looked as strong but bobbled a sequence, and her 3rd go she made it all the way to the final move before falling to the mats. Finally Jesse had her turn, and she cleanly and decisively flashed her way to the win (after countbacks, because she and Chelsea tied on the final but she’d beat Chelsea in the main comp). 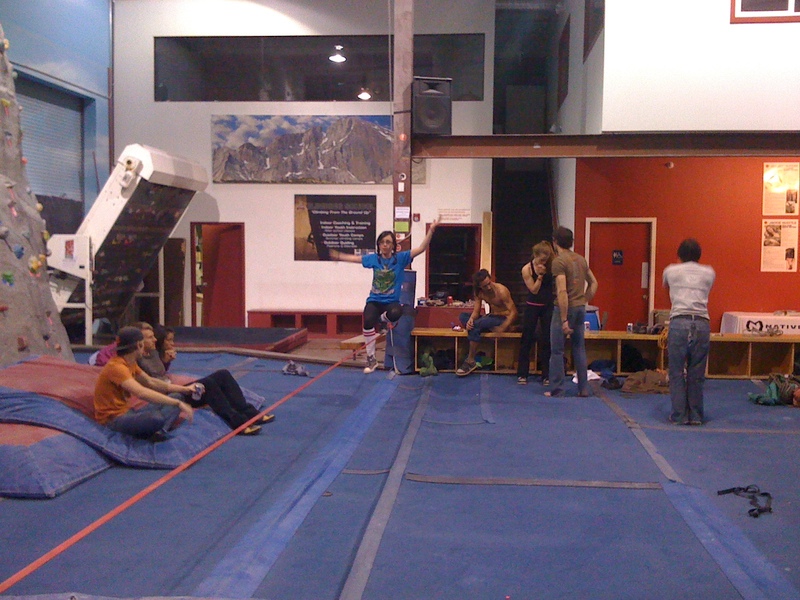 Highline Highball — Problems Set, Gym Clean, Slackers Slacking — Comp Tomorrow!!! We were so far along by lunch that we went out to Pupusas for a delicious lunch. 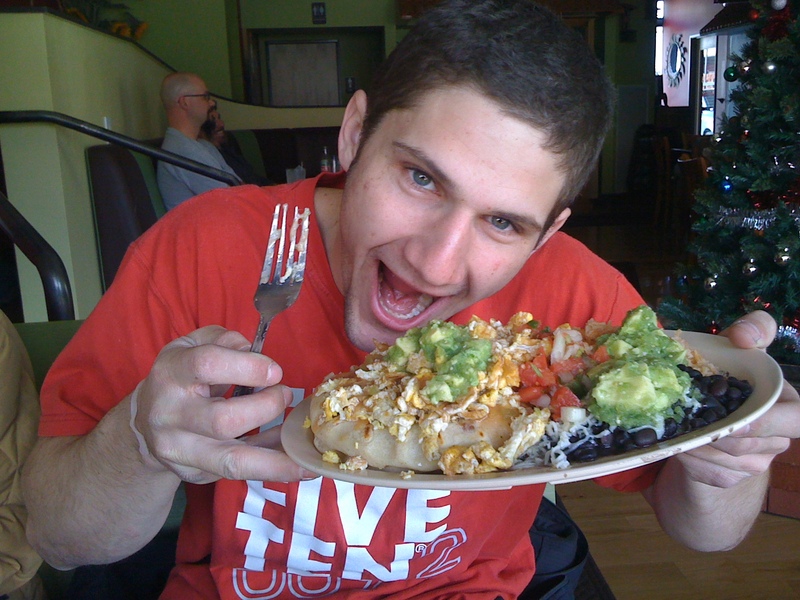 Garrett shows off his Pupusas Breakfast with black beans, extra eggs, and salsa. Yes, it was fantastic. Slack practice begins on the low line. 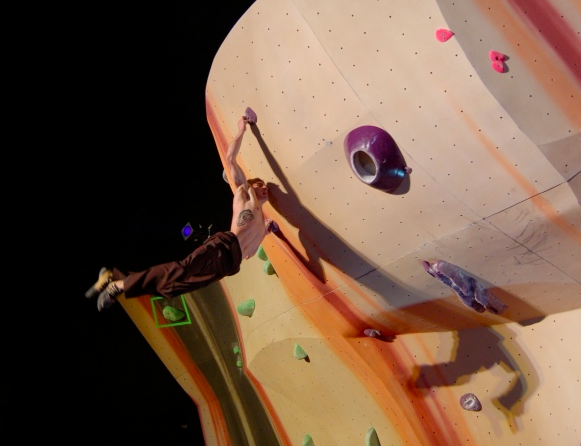 See you all tomorrow for the Highline Highball comp!!! Food Drive wrap-up, the Beach pads get a face-lift, Highline setting starts, and Carlo & Jon are back! 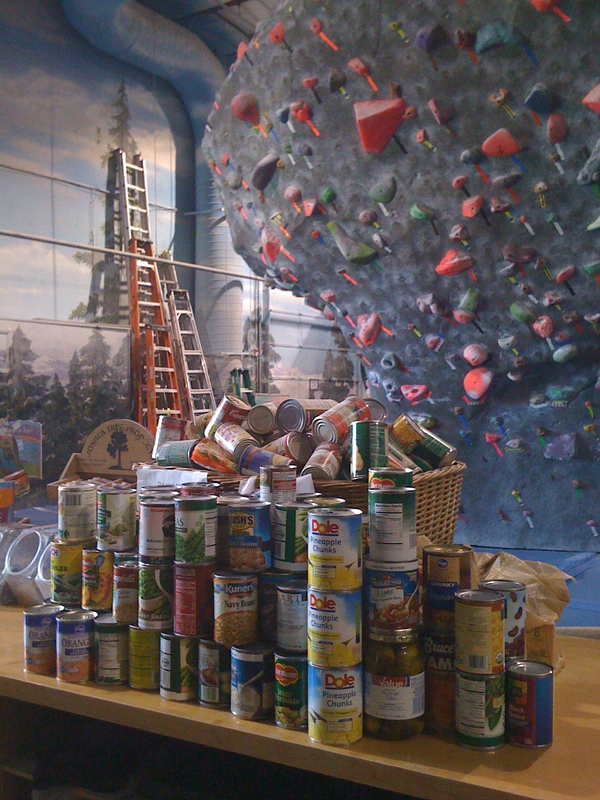 Our Thanksgiving Food Drive collected a bunch of cans for Community Food Share. Thanks to everyone who donated! Josh, Brett, and a bunch of volunteers spent their Wednesday re-stuffing and shuffling the Beach’s Asana comp flooring to make a more uniform surface. Remember that landing on this surface is different than standard blue padding or crash pads, and if you’d like to know more about it please ask at the desk. Pads stacked to be re-placed. Brett Merlin and Brent Apgar considering the pad puzzle. Highline Setting Starts & Carlo and Jon are back! 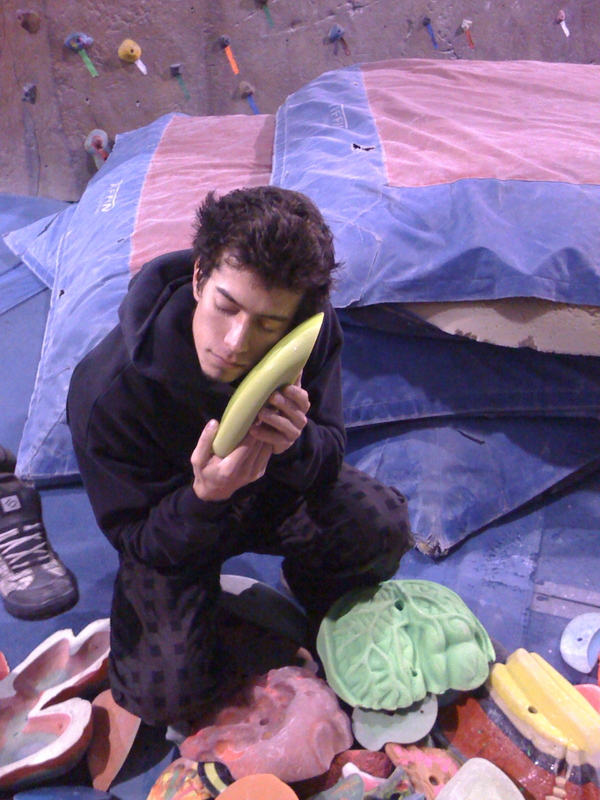 Today was the first day of setting for SBS Season VI Comp 3 – the Highball/Highline Comp. Last night after they finished improving the padding we stripped the Beach and the Dojo. When we strip the walls, part of the time is always spent removing stuck holds. We are only able to access the back of the Beach, part of the River, a very small section of the Hueco, and most of the Dojo, and when a hold is stuck in one of those places it’s often preferable to unbolt the hold using a long arm and wrench on one side of the wall and a pair of vice grips on the other. Last night, to welcome Carlo home, we let him be the vice grip guy on a hold stuck high on the roof section of the Dojo. 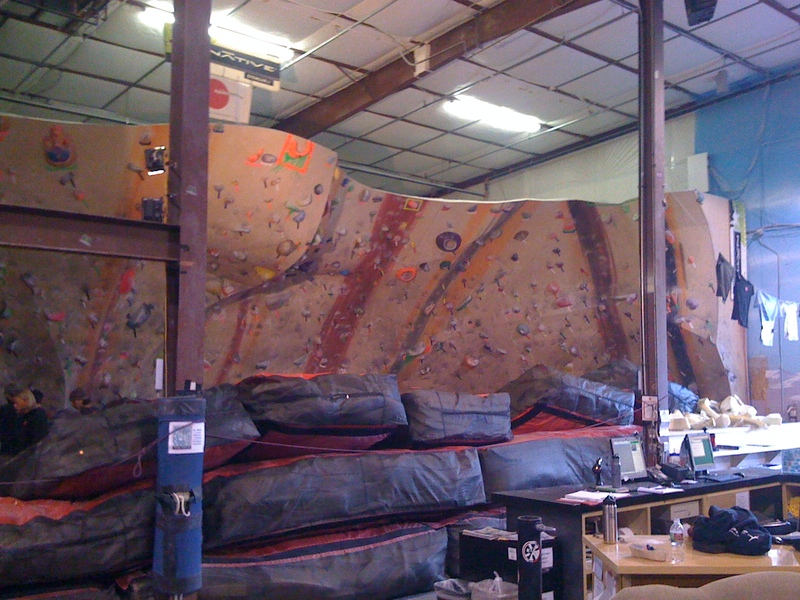 As is obvious if you consider the height of the Dojo cave and the depth of the workout space above the Dojo, there isn’t much room to fit a setter in to get at the t-nuts. You have to crawl on your belly to reach some of the topmost t-nuts. Dusty is an understatement. This is what Carlo looked like after two long plane flights, a 15 hour layover in Boston, major jet lag, a few beers, an hour and a half of stripping, and 10 minutes with the vice grips. Was that shirt clean? Oops. Doesn’t Carlo look glad to be back? The dust on his shirt kinda looks like a weird alien print, or something you'd see on the cover of a Tool album. 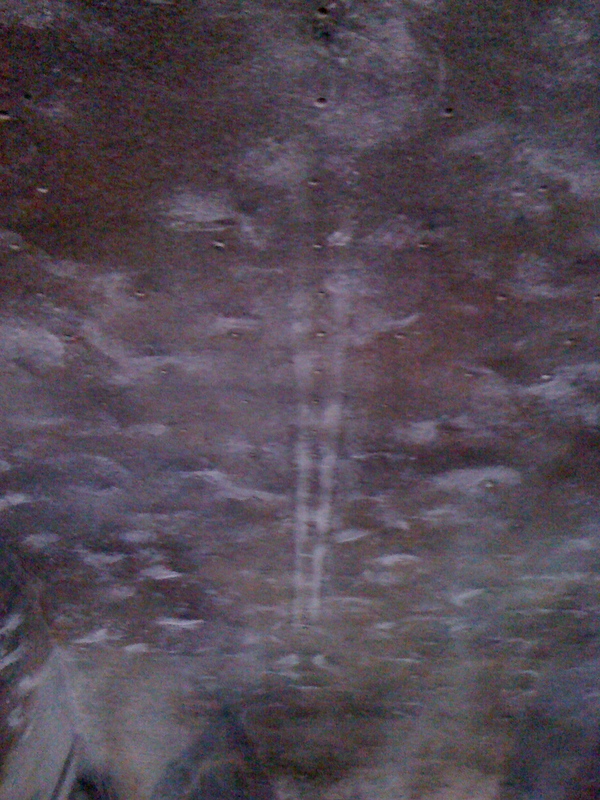 When we took down the tufa, this is what the wall looked like. 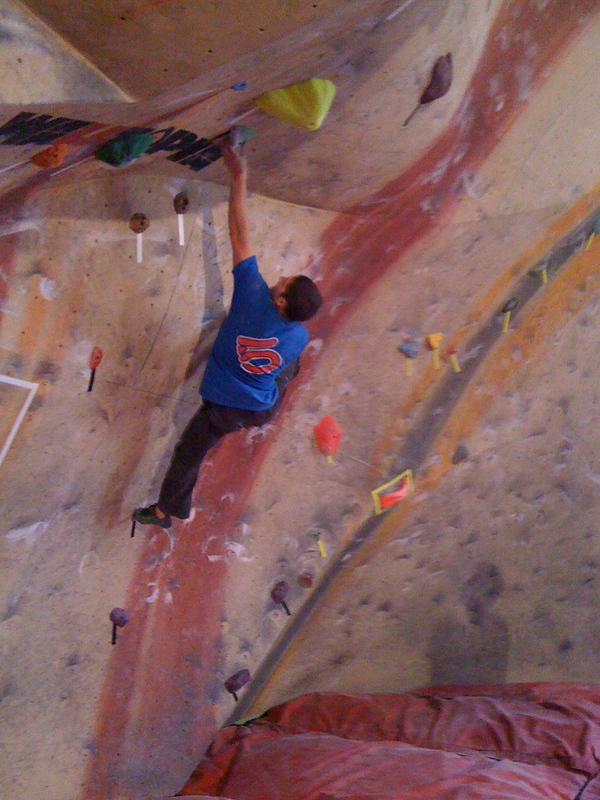 Garrett forerunning an early iteration of a problem for the Highball/Highline on Saturday. Jon's shadow watches him. 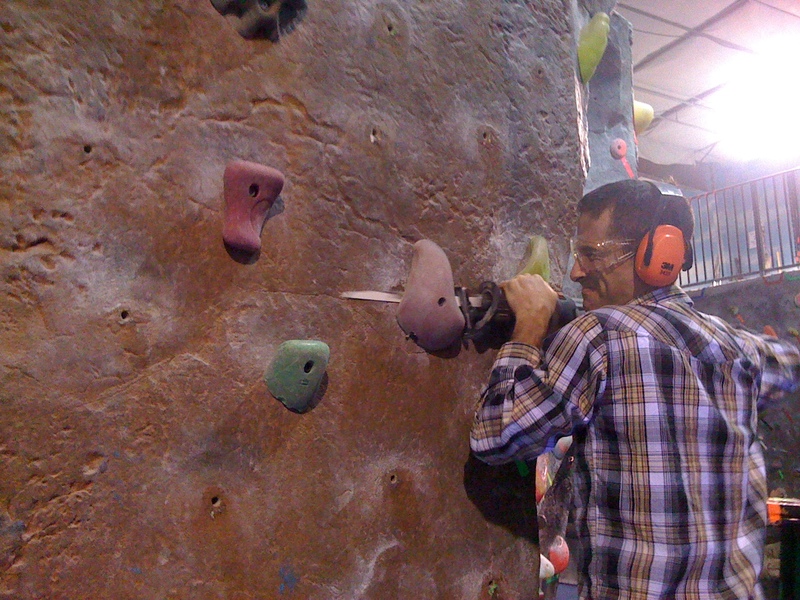 Brett Merlin, Membership Coordinator and Climbing School Director, finds out what it's like to cut a hold off the wall with a sawzall. When we were getting ready for the comp there was one hold that didn’t get cut off the wall. Because Psychedelia is dark, and there were no problems around it, we just taped it off for the comp and decided to deal with it after. After was Thursday, when Brett was sitting at the desk and told us to cut the hold off the wall. We decided to be generous and offered him the opportunity to cut the hold off himself, since he’d never cut one before. He was game. The above picture is him, all suited up, before he tried cutting hold. Brett, several hours later, with a new blade. The hold was a Voo-Doo, which means it had a special rubberized backing that they use to keep holds from spinning. He began sawing, and as the saw heated up the rubber stuff liquified and made this goo that gummed up the blade and made it hard to see what he was doing. The original blade he was using had been used before, and despite being labeled “Fire and Rescue blades”, they’re good for about 1 bolt cut a piece. Anyways, Brett sawed away with that first blade for a while, but made not great progress, and after a while we let him off the hook ’til we could go to Fastenal and get him some new blades and some safety goggles (you’ll notice that he started out with his Native sunglasses). 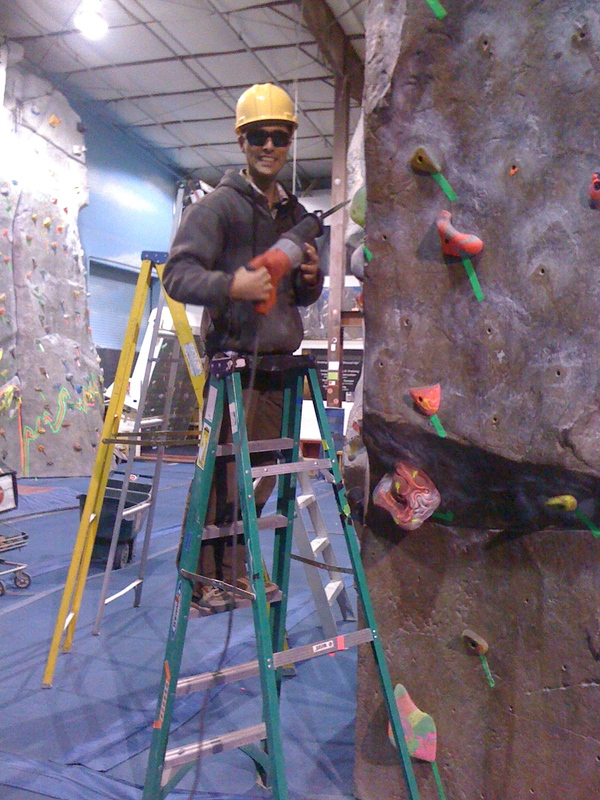 After lunch we came back and got Brett re-set up on the ladder with the sawzall. He made good progress at first, sawing 1/2 way through the bolt quickly. Then things started to go downhill. He sawed and sawed, and made a little progress, but he just couldn’t get through that last 1/3 of the bolt. Finally I thanked him for his help and let him off the hook, then took a different old blade (the new one he was using was pretty trashed) and went at it. After a few minutes of eyeball vibration, I replaced the blade with a 2nd new one (I hate using more than 1 new blade/bolt if possible) and quickly finished cutting the bolt. The new blade isn’t even wrecked, which is great, so we can hopefully get another cut out of it. I think the reasons this particular bolt was so epic were 1) the rubberized backing on the hold, and 2) we were sawing solid bolt (not the threaded part). And finally, Carlo's trip is still going well. This week, Jon will be flying to Switzerland to join him. We're all very jealous boys. For more, click the pic to check Carlo's blog.